Algae are naturally-occurring microscopic organisms that are found in fresh and salt waters of Virginia and around the world. Many are beneficial because they are major producers of oxygen and food for many of the animals that live in these waters. Most algae do not harm people, wildlife, or the environment. But some types of algae in Virginia can be dangerous. Algae species in fresh and salt water may multiply rapidly when environmental conditions are favorable for their development. 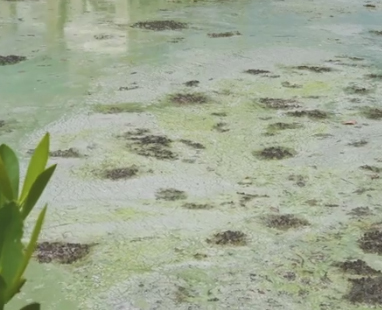 The great number of algal cells in the water results in what is called an algal bloom. A bloom often (but not always) results in a color change in the water. Algal blooms can be any color, but the most common ones are red or brown and are known as either “red” or “brown” tides. Most algal blooms are not harmful but some do affect fish and humans, as well as other animals like birds and marine mammals. These are known as Harmful Algal Blooms (HABs). If water is discolored, murky, has an odor, or if there appears to be a film on the water surface, swimming is not advised for humans or pets. Please contact the HAB Hotline to report your observations and so that surveillance of the area can be conducted. The Virginia Department of Health works in cooperation with the Virginia Department of Environmental Quality, Old Dominion University, the Virginia Institute of Marine Science at the College of William and Mary, to monitor Virginia’s waters for harmful algae and to prevent illness that may be caused by these organisms. This group is collectively known as the Virginia HAB Task Force and was formed in 1997. Learn more about algal blooms in Virginia – Click here.